Hull wreckage of Vessel No. 1, model barge. The West Memphis Boatwrecks Project at site 3CT243 was an exercise in emergency “underwater” archeology that took place on dry land. 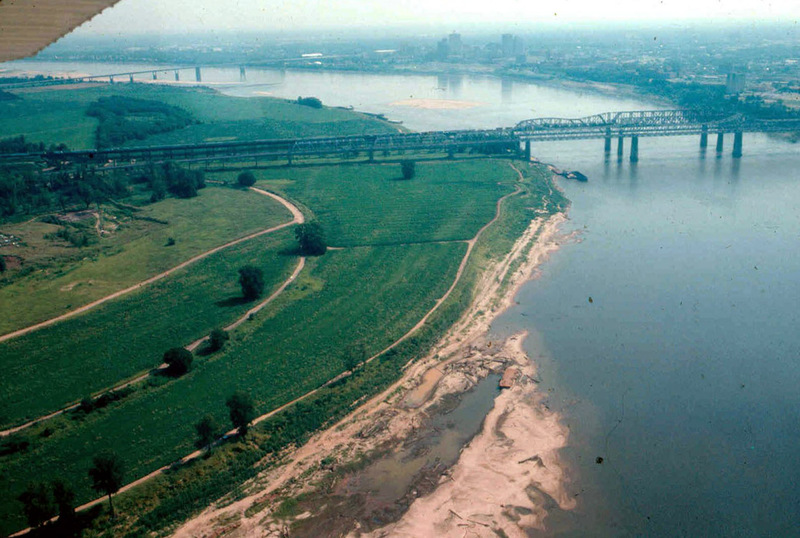 During extreme drought conditions in the summer of 1988, the Mississippi River dropped to record low levels of 40 feet below the top of the riverbank. 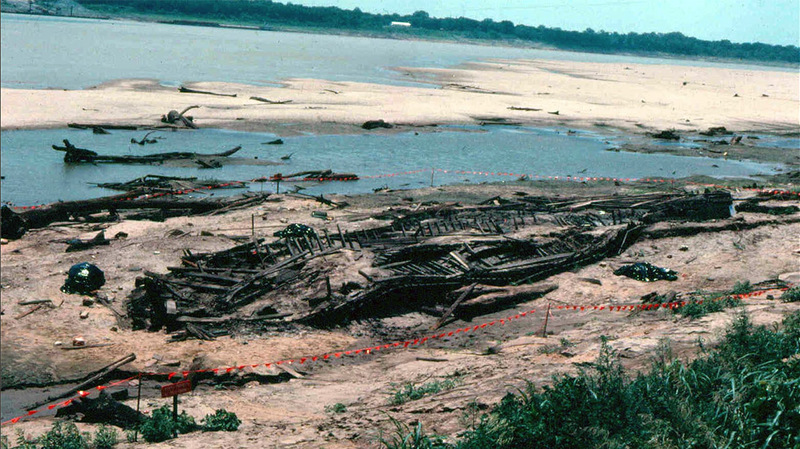 Near the Interstate-55 bridge, at the upstream head of an area known as Engineers Beach, over four acres of wooden boat wreckage were exposed, including an odd-looking vessel whose hull was pointed at both ends, prompting news coverage of a “Confederate Viking ship.” The Arkansas Archeological Survey and their allies went into action. 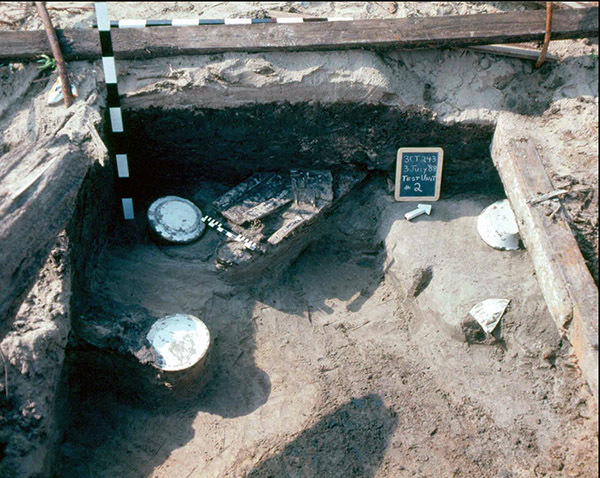 Excavating dishes from the galley of Vessel No. 2, steamboat. One of the first problems was jurisdiction. Who owned the boat wrecks? It turned out to be the State of Arkansas. Under the State Antiquities Act of 1967, archeological resources on state land are protected, and if significant there was a duty to prevent looting and preserve information. But how could this be accomplished? Skip Stewart-Abernathy (then ARAS station archeologist at ATU) would take charge of the fieldwork. State Archeologist Hester Davis explored the legal arrangements and sought funding, which came from several sources. Mary Ann Goodman, then president of the Arkansas Archeological Society, recruited volunteers. With a combined crew of Survey staff, Society members, and others, the Boatwreck site was explored and documented over seven weeks of hot summer weather. Needless to say, the results did NOT confirm a “Confederate Viking ship”; they did confirm the remains of one of the few model barge wrecks to be found on the inland waterways, as well as a stern-wheel steamboat that still doesn’t have a name. Altogether the remains of six vessels were identified, documented, and explored. 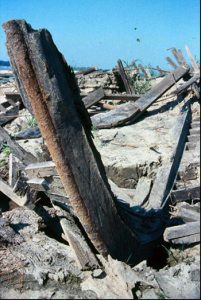 A lot of wreckage at the site was a jumble of mixed debris, but important information was obtained about the construction of certain wooden hulled vessels dating from around the end of the steam-powered era of river transport. All the examined boat wrecks were working vessels, towboats or barges, so the artifacts and other data gave a glimpse into the lives of river men on the Mississippi around the turn of the 20th century. Probably the most interesting of the wrecks are Vessel No. 1, a wooden model barge, and Vessel No. 2, a stern-wheel steamboat. Excavating in the bulkhead area of Vessel No. 2, steamboat. 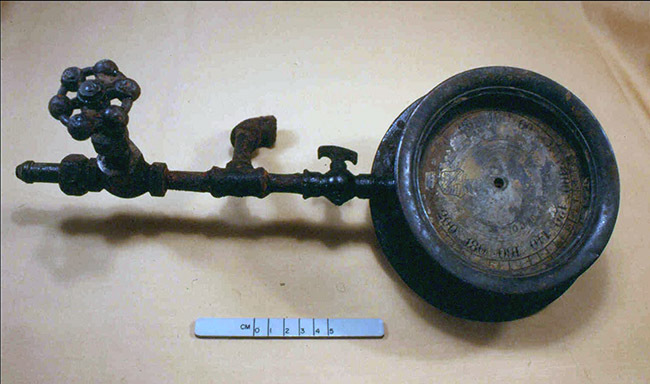 Ashcroft steam pressure gauge from wreckage of Vessel No. 2, steamboat. Stem post of Vessel No. 1, model barge. The model barge takes its name from the shape of the hull, which is pointed or “modeled” at both bow and stern. In this sense, it might resemble a gigantic canoe, but its function was the same as the big barges used for transport on the river today—they were loaded with cargo and pushed by tugs or towboats up and down the river. Model barges were in use throughout the 1800s but were in decline by the 1920s. Few examples of model barges survive, and Vessel No. 1 from 3CT243 is probably the one in best condition to have been documented. Many details of its construction were carefully measured, drawn, and photographed. The craft was 137 feet long and 30 feet wide with a five and a half foot depth of hold. With its unusual double-pointed hull, and one of its stem posts jutting upward, this was the vessel that had caught the public eye when the debris field was first exposed. Vessel No. 2 was a wooden-hulled, stern-wheel steamboat, broken apart and mixed with other debris. A lot of this steamboat was present, including big hull sections, a bulkhead and side sections with windows and doors, pieces of the stern and paddle wheel, steam line and boiler stacks, smokestacks, a tangled array of hogchain (connecting wrought iron rods used to reinforce and stabilize the hull), interior fittings, and numerous artifacts. There was evidence that salvage work had been carried out on the steamboat at some point, probably soon after it went down. Artifacts recovered included everyday items like china plates and glass bottles used by the crew, working items like coal buckets, and an Ashcroft brand brass steam pressure gauge with the date “1876” on its face. However, study of various artifacts led the researchers to conclude the steamboat had been wrecked after 1910. Despite exhaustive documentary research on wrecks in the Memphis area, a name for the boat could not be pinned down and there were no clues in the wreckage itself. A summary of this work was published in 2002 by the Arkansas Archeological Survey as Popular Series No. 4, Ghost Boats on the Mississippi: Discovering Our Working Past, edited by Leslie C. Stewart-Abernathy. It can be purchased by contacting archpubs@uark.edu. See our Publications Catalog for details. Aerial view of the Boatwrecks site, 3CT243, looking upstream toward the Interstate-55 bridge. 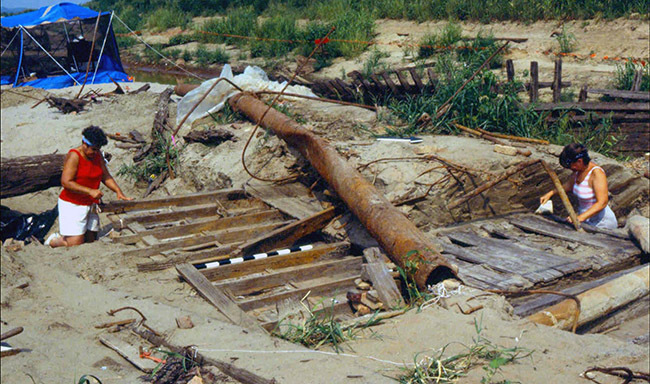 The sandy area of exposed wreckage is in the foreground.